Yellow means caution, even for plants. While leaf yellowing, known as chlorosis, may be a signal that there is a problem that requires attention, it may also be normal. Understanding when this coloration is to be expected and when it indicates a problem is essential to be sure you’re giving your plants the proper care. Chlorosis is the scientific word used to indicate the full or partial yellowing of plant leaves or stems and simply means that chlorophyll is breaking down. There are times when this is normal, expected coloration, and there are times when it indicates deeper problems that need attention. Normal Chlorosis – Yellowing leaves at the base of an otherwise healthy plant is normal; the plant is simply utilizing the nitrogen and magnesium for exposed leaves near its top rather than older, lower leaves. These yellowed, older leaves will eventually shrivel and fall off as newer growth emerges at the top of the plant. Chlorotic Response to Light – Moving a plant from full sun to shade, or visa-versa, can cause yellowing leaves as the plant reacts to the change and stress. Make sure that you grow and maintain your plant in the proper light. Also bear in mind seasonal changes that may affect how much light a plant is exposed to, even if it hasn’t been moved. Chlorotic Response to Moisture – Sudden changes in soil moisture may damage or kill plant roots which can lead to yellowed leaves as the roots are unable to take up sufficient moisture. Most otherwise healthy plants, however, are able to grow new roots as they readjust. Maintain correct soil moisture or move the plants to a more favorable environment. Mineral Deficiency – A shortage of some key mineral nutrients will cause chlorosis in plants. Often, a yellow leaf indicates a lack of nitrogen, however, magnesium, iron, sulfur or manganese deficiencies are indicated by yellowing leaves with prominent green veins. 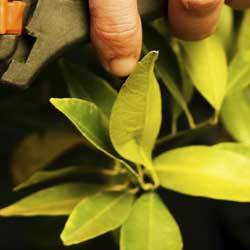 A magnesium deficiency will manifest itself in the yellowing of older leaves. On the other hand, an iron deficiency presents itself in the yellowing of new or young leaves. A simple soil analysis will let you know what minerals or trace elements your soil is deficient in. Soil Factors – Although essential and trace elements may be present in the soil, many other factors affect how the plant uses and absorbs them. If the soil pH is too high/low or there is too much salt in the soil, the plant will not be able to utilize the available nutrients. Test your soil pH and adjust as necessary to be sure the plant can absorb nutrients appropriately to maintain proper foliage colors. Toxins – Although this doesn’t happen frequently, pollutants like paint, oil, chemical solvents, airborne herbicides or pesticides or other pollutants may cause leaves to turn yellow and dark brown before dying. In this case, remove and dispose of the plant and its surrounding soil, and mark the area to be sure it can be treated appropriately and no other plants are inadvertently exposed to the toxins. It can be alarming to see healthy plants suddenly yellowing, but by understanding chlorosis and how it happens, you can take steps to determine the cause of the color change and what to do to help your plants recover.